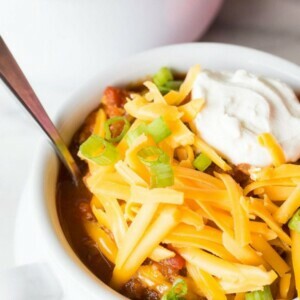 Another great chili recipe for fall! Heat a skillet to medium-high heat. Brown the ground beef in the pan with the onion, bell pepper and garlic. Remove the pan from heat, and spoon out the grease. Return to heat and add the tomatoes, pumpkin, chili powder, cumin, pepper and salt. Stir well. Cover and simmer for 20 to 30 minutes. Serve topped with cheese, sour cream and chopped green onion. Lighten this up by using leaner ground beef, low fat cheddar and light sour cream. Serve this chili with pumpkin cornbread!